"Now, more Londoners will be able to show their support to the capital's brilliant, talented street performers," said London mayor Sadiq Khan. Charlotte Campbell, a full-time busker, was part of the trial and says that after two weeks it "had a significant impact on contributions". The card readers, which plug into smartphones and other devices, allow tap-to-donate fixed payments. "More people than ever tap-to-donate whilst I sing, and often, when one person does, another follows," Ms Campbell said. 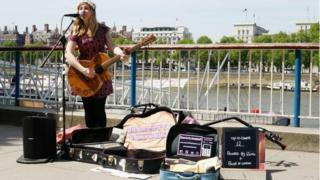 The organisation Busk in London, which is working with iZettle on the scheme, said it would be made available to buskers in all the capital's boroughs over the coming months. Earlier this month PayPal announced it was buying iZettle for $2.2bn (£1.6bn).